Long Beach, California seemed to be overwhelmed during Fourth of July weekend, as Anime-lovers and those alike gathered for this year's Anime Expo. While the norm of panels, workshops, viewing rooms and more awaited attendees, a fair amount of visitors were not only fans of Anime… but also previous guests of this convention dynasty. 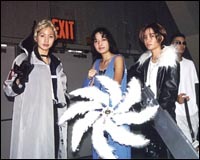 The Final Fantasy VIII gang inspire awe by merely standing there! Angelo woulda came but they don't let pets in the hotel. As guests returned for another taste of the convention, fans did as well. 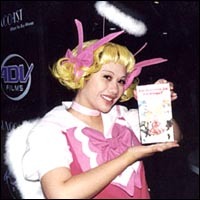 Anime Expo 2001 not only broke records with its attendance count, but with the unbelievable caravan of booked hotels - The Hyatt, Renaissance, Westin… Well. You get the idea. Even before the convention began, the Fourth of July had already showcased many-a-cosplay, which gave a mere taste of what was to come that very weekend. Considering the charming location, friends and companions alike could venture along the boardwalk, to take a moment to just peruse the line of shops and restaurants… even in costume! There's our Dai-chan, cosplaying as the character she lends her voice to in America: Noelle, of the new series Tenshi Ni Narumon!. Look at her, taunting us all with the VHS box. As the convention commenced on the Fifth of July, attendees flooded the premises - - Video viewings, dealers room, panels and even a special set up for the gaming room were jam-packed, as AX-weekend started with a bang. All of the programming seemed enjoyable, as topics for panels this year seemed to be very fan-based. The dealer's room awaited eager buyers, and featured a wide-ranged array of new products, as well as old. Arcade Infinity allowed AX to feature several of it's machines, such as Dance Dance Revolution, which literally rocked the house as some folks seemed to never even want to leave the gaming room. Cosplay was extremely abundant this time around, seeing as more and more seem to want to get a piece of the action. Two of the greatest aspects in cosplay this year were undoubtedly J-Rock themes, and of course, part of the infamous King of Fighters Friday, which ruled the second night. Security... Security... Those Pokémon bozos are at it again... Here we see cosplay of dual Officer Jennys, and Butch and Cassidy of Team Rocket, complete with a large homemade Victreebel! A long-awaited masquerade followed that Saturday, however, many attendees were not able to attend, due to the seating capacity. A trail of contestants graced the stage that night, and many cheered on. Congratulations go out to those whom received awards and honors, as well as those whom just came to have fun. 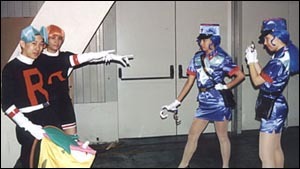 Many have said that this year's AX was truly unforgettable in many senses - This, I can totally agree with. ^.^ It left nearly as fast as it came, and we all await next year's gathering. 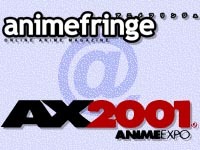 AX2K2… or bust! See you all then!